Pro tip: Before I start this week’s post I’d like to tell you about an awesome new content curation/social media tool that saves me tons of time called Quuu. I first heard about the company when I interviewed their founder for my weekly Forbes column on starting a company by on solving problems. Check out Quuu.co (it’s free). In fact, in just five short years, the amount of content we consume over the web has increased 105 percent. In short: if you’re not yet investing in digital content, you should be. Done right, it’s not only effective – it’s cost-effective. This means that while you’ve probably only ever dreamed of gaining that prime-time advertising slot on TV, you can afford an effective online content strategy. Of course, the cost of content varies. A lot. You could spend a hundred thousand dollars a month on digital content and promotion, if you wanted to. Thankfully, you don’t have to. When it comes to content marketing, you control the cost and, within reason, you can spend as little or as much as you want, and still get results. This means that whatever the size of your company and however far your budget can stretch, you can and should be investing in content. Don’t believe me? Keep reading and I’ll show you ten examples of simple content from (mostly) small companies that’s reaped big rewards, and talk you through what you can do to replicate their success yourself. Digital optimization platform Monetate plays in the big leagues now, but even in the early days they were pretty serious about content. In 2011, they employed a 3-person content team who were responsible for the creation of three to five blog posts a week, alongside infographics, whitepapers, case studies, and webinars. Within six months, traffic to the website had increased 255 percent while unique visits increased 353 percent. They also doubled the amount of sales opportunities that had been influenced by the company’s marketing. They’ve taken a usually quite dry and technical subject and repositioned it in a fun and unexpected way. This gives the content an unusual and impactful USP, but best of all, it’s a strategy that you can replicate – whether your content team has 1, 3, or 30 people. Key Takeaway: Use content to address your customer’s concerns rather than promote your company, and increase the appeal of dry subjects by adding an unusual twist. You probably won’t be surprised to see that Pic’s website is rife with recipes that use their products. If you have a food or drink product, this strategy is pretty much a given – it’s interesting content and it encourages consumption of your product. Shortly after publishing, the post had reached 11,200 people. It’d also had 2,209 clicks, 456 likes, 57 comments, and 26 shares. That’s not a bad result for a little bit of photoshopping. I think a lot of us, when we think about “content”, think about the content we publish to our blog. The key lesson here is to think beyond that. Videos are content. Games are content. Images. Podcasts. eBooks. Emails. This is all content. Neil Patel described content (for web marketing) as “a piece of information that’s available electronically.” In other words: content is a broad discipline that embodies much, much more than the blog articles and infographics we often think of first when the word “content” is uttered. Make the most of the off-site tools at your disposal – some of them (Facebook, for instance) offer masses of potential for minimal investment. You don’t need to be a big company with a budget to match in order to utilize it. Key Takeaway: Think beyond your blog. There are endless content platforms available to you, so use them. Movoto is a pretty sizeable company today, but they weren’t always as well known. The company itself launched in 2005 and was an early adopter of content, launching their blog two short years later in 2007. It’s safe to say that in the years since, they’ve utterly mastered the content game. Their content is high-quality, consistent, original, and engaging – pretty much everything a content strategy should be. However, Movoto’s content really came into its own in 2012, when their novelty real-estate series began to take shape. The idea primarily revolves around taking fictional buildings and calculating how much the building would cost to purchase if it was real. One of their earliest posts in the series established the cost of Barbie’s Malibu Dream House (just $18,000, in case you were wondering). However, they’ve not stuck strictly to the “how much would it cost” premise. Other notable topics include a quiz to figure out which Breaking Bad characters’ house would suit you best, an infographic detailing how to wrap your house in bacon, and a tool to find out how many bricks of LEGO it would take to build your house. My favorite thing about Movoto’s content is how simple most of it is. Much of their earliest content is text-based. They make interactive content (mainly tools), but they’ve always made sure not to overcomplicate things. Over time, their content has become more design-led, but this hasn’t been instrumental to their success – content based upon little to no graphic design has worked for them too. In fact, one of their most successful pieces to date was actually published in 2013. In Expecto Valueo, Movoto showed how much Hogwarts Castle would cost, and how they came to that conclusion. It’s done… okay: it’s been pinned more than 1,000 times and shared more than 700 times on Facebook. The concept itself isn’t new to Movoto – as mentioned above, they had been calculating the cost of fictional properties for around a year before adding Hogwarts to their portfolio. I think it’s safe to say then, that the subject matter’s key here. People kind of love Harry Potter. However, Movoto has had great success with their “novelty real-estate” series overall – clearly there’s more at play here than popular culture. But what? The concept is clever, but easy to understand once explained. It’s appealing to people who work or are interested in real estate because it takes principles they’re familiar with and applies them to novelty situations. Likewise, the content appeals to a wider audience by centering on familiar buildings from well-loved media. What’s more, the content itself is short, sweet, and simple. The information is clearly presented and it’s quick and easy to understand. In short, it’s topical, informative, and entertaining – and it’s something any company can do. Key Takeaway: Find a way to link your industry to a topic with mass appeal, and when you find a strategy that works, stick with it. Canva doesn’t have a blog, they have a “Design School” (be sure to check it out – it’s pretty spectacular). However, while the name implies educational guides and “how-tos”, their “blog” offers so much more. Canva’s content can be fun, inspirational, useful or – of course – educational. Sometimes, it manages to be all four. You might argue that they’re not a “little guy”. That it’s easy for them to compete. I’ll give you that – at the time of writing, they have 6.2 million users. That’s no small feat. But… the company was only formed in July 2012, and Canva itself only became available to the public in 2013. They’ve achieved a hell of a lot in the time since. Is content solely responsible? Of course not. I think a $3.6 million cash injection and the employment of ex-Apple evangelist Guy Kawasaki played some part in their success. But as a design start-up, it’s pretty imperative that they showcase their own eye for design and what better way to do that than through content? All of that is to say that their most successful piece of content according to shares (95.5k to be precise) might surprise you: it’s a long-form article about the benefits of taking long walks. Despite containing very little imagery, the piece has been shared more than 60,000 times on Facebook, 400 times on Pinterest, and 2,000 times on LinkedIn. It’s also (according to Ahrefs) received links from 163 different domains. The really great thing about this is that it’s something you could emulate. You don’t need a design and development team – you just need to pinpoint a topic that resonates with your audience and write about it well. In an article for The Next Web, head of Canva’s growth marketing Andrianes Pinantoa spoke about part of Canva’s brainstorming process and how even they, don’t always hit the mark. “The first thing we did is to learn from the best – our industry competitors. Previously, we would try to come up with original ideas and write about topics that promote “thought leadership”. We wrote what interested us. Sometimes the articles we published would catch on. But many other times they didn’t. Key Takeaway: Effective content doesn’t have to be image-led; well-written, long-form content on timely and interesting topics can achieve similar, if not better, results than imagery and infographics. MoveHub struck gold last year when they began designing a series of map-based infographics that provided at-a-glance insights into issues such as the cost of living around the world and the happiness index around the world. You’ve probably seen them already because they were featured everywhere – Business Insider, TIME, Huffington Post, and the UK Independent, to name a few. Founded in 2012 and with (according to LinkedIn) less than 10 employees, this is a young company with an impressive content portfolio. But what is it that made these “around the world” infographics gain so much success? Let’s start with the design: they’re simple yet attractive, but most importantly, they makes the information easy to understand. Every single person in the world can relate to, in some way. And, as you likely already know, creating content that consumers can relate to and that triggers an emotional response are two key ingredients in content that goes viral. Key Takeaway: Don’t overcomplicate your content – a topic that triggers an emotional response combined with smart yet simple presentation equals a recipe for success. Saving Lincoln is an independent film that depicts the real-life relationship between Abraham Lincoln and his bodyguard, U.S. Marshal Ward Hill Lamon. The film’s marketing budget was, unsurprisingly, very small. Consequently, gaining an audience for the film was going to be tough. But not impossible. A team of creative writers maximized the potential of Twitter as a marketing tool to build awareness of the film for just $1,000 a month. Through the Saving Lincoln Twitter account, the team charged with establishing an audience drip-fed a series of stories that were designed to complement and add further dimensions to the plot of the movie itself. Each story was told over several Tweets a day, with each individual story building upon the last. Fridays were “cliffhanger day” where the final Tweet of the week would set the stage for the stories to resume the following Monday. Key Takeaway: Diversify your strategy by looking at ways to split content into bite-sized chunks and distribute it over a period of time. Zoosk is another excellent example of a company who, while not exactly “little” themselves (the dating service is available in 25 languages and more than 80 countries, and they’re currently listed at #2971 in Inc.’s 5000 fastest-growing private companies in America list), boast a content strategy that can be easily emulated by companies with far less budget to spare. They’ve also been in the content game since mid-2009 (if you’re interested, here’s Zoosk’s first ever post). It wasn’t until later that year that the dating site really began to take off. What’s more, Zoosk’s content has played a key role, not just in gaining coverage for the brand, but in boosting customer retention (or at least, in encouraging repeat visits to the site) as well. Understandably, the main downfall to any matchmaking business is that once a successful match is made, two members leave. All being well, they’ll never be seen again. To buck this trend, Zoosk uses content to give customers old and new a reason to keep visiting the site. Amongst the obligatory dating tips, you’ll find infographics, videos and love buzz (essentially celebrity love news). Zoosk also tries to engage successful matches by encouraging members to share their story in the Zoosk couples section. However, Zoosk’s content USP – and the strategy I most want to draw your attention to – is how they collate and present their own, first-hand data. 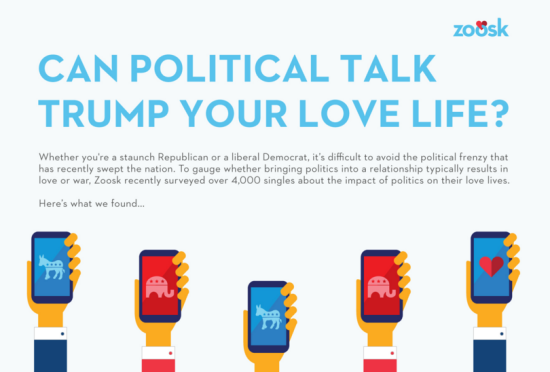 To gather the data, Zoosk surveyed 4,000 singles (they don’t state whether these singles were customers or not) and presented the data in a short, but informative infographic. The resulting content piece is to date, one of Zoosk’s most successful: it’s led to more than 1,200 Facebook interactions and links from nine different domains. This is an excellent example of how companies of any size can leverage internal data to create quality content. You’ve got your own internal data in the form of your customer CRM, your Google Analytics and a handful of other services. Why not put it to good use? Key Takeaway: Leverage existing customer data to influence content ideas and execution or if necessary, utilize customer surveys in order to generate new data. Forks Over Knives delivers healthy, chef-prepared meals to their customer’s doors (they also produced a feature-length documentary that captured the attention of the food industry a few years back). Don’t worry though – I’m not suggesting you hire a film crew and get to work on your first blockbuster. Much of Fork Over Knives’ content is far less ambitious – and much easier to replicate. Their long-form articles do particularly well – this piece explores five common misconceptions about food, through the eyes of a doctor. It’s been shared more than 33,000 times on Facebook. And as we saw with the example from Canva, this makes it clear that content doesn’t need to be design-intensive or image-led in order to do well. Yes, images have been shown time and again to boost engagement. But does that mean pretty images will compensate for shoddy writing? Of course it doesn’t. It also doesn’t mean that a piece of accurate, engaging and informative content can’t do well, sans-pictures – as we’ve seen in the example above. What does this mean? It means that Michelle is much more than a great writer – she’s actually qualified to engage in these topics. She hasn’t just Googled “misconceptions about food” and written about them – she’s genuinely a trustworthy voice on the subject matter. Thankfully, this is an easier strategy to replicate than you might think. Does Forks Over Knives employ Michelle? I doubt it. Chances are, they work with her on a freelance basis and pay her to write content for them as needed. Yes, there’s a cost attached to this strategy (what strategies don’t have a cost attached? ), but it’s a cost that comes with huge potential rewards. The key here is to build an ongoing relationship with an expert and influencer in, or related to, your industry. Ask them to contribute content regularly – once every month or two should do – and over time their name, and consequently their expertise, is likely to become associated with your brand. This brings with it far bigger wins than you’ll see by releasing individual content pieces in isolation. Key Takeaway: Don’t be afraid to loosen the reins a little and outsource some of your content creation – especially when covering subjects that aren’t your forte. You’ll save time and benefit by being able to tap a subject matter expert. Okay, before you rip my head off and say “Sujan, what were you thinking?” I’ll be straight with you: footwear specialist’s Walking On a Cloud’s content is lacking a little in the design department. But you know what? It doesn’t seem to matter – it’s working for them anyway. This is great news for the little guys since, as with many of the examples above, it shows that you don’t need to invest mega bucks in design and development in order to create effective content. Their strategy involves a mix of text-based articles and infographics, all geared around one key topic – unsurprisingly, shoes. Much of their content is more sales-focused and product heavier than we’ve seen in the examples above – a strategy I’d encourage all companies to approach with caution. However, some brands in some industries can make it work. Walking On a Cloud is one of them. Being a consumer brand helps. Selling a product that a lot of people are passionate about and buy regularly helps more. If your product (or service) is something your customers are genuinely interested in (i.e. they don’t always buy out of necessity) and your industry is constantly changing and evolving (ensuring you won’t run out of fresh material), then you’re in a pretty good position to focus your content around your products. Walking On a Cloud’s infographic about “Must-Have Women’s Shoes for a Beach Vacation” for example, taps into their audience’s interests and addresses questions they’re likely to be asking while browsing the site. Consequently, it’s no surprise that it’s pushing 200 Facebook shares and more than 100 tweets. Key Takeaway: Don’t shy away from visual content just because you’re new to it or don’t have the resources to create it in-house. With the right subject, design might not be as important as you think. Vakil Housing is following a simple strategy with their blog – creating informative content geared around buying and selling property in India. Their goal is clearly to educate their audience on the whats, why, and hows of property investment, while simultaneously (and subtly) encouraging investment in a Vakil property. While Vakil’s text articles tend to rack up a respectable number of shares (considering the size of the company, at least), they struck it big with their attractive infographic-style guide to making safe property investments: it’s been shared more than 3,000 times on Facebook. I say “infographic-style” because it’s far from the traditional data-led idea of an infographic. This is essentially an article presented within an image. Great for search engines? Not really. But… perfect for sharing. Key Takeaway: If you’re struggling to find interesting or relevant data to present in an infographic, try illustrating an article and presenting that within an image instead. So we have ten, mostly very different examples of content that prove the little guys can compete in this increasingly aggressive game we call “content marketing”. We’ve seen how infographics, social media posts, first-hand data, and long-form articles can all drive traffic and shares, meaning that regardless of the resources you have at your disposal you can create content and you can compete. Each and every example seen above focuses on the interests of their audience. Not the interests of the company. This is instrumental to the success of any content campaign. It’s not about promoting yourself (not directly, at least). It’s about tapping into the common interests your audience shares with each other and with your industry, and providing content that informs, entertains, or inspires – or all three for best results. The post 10 Great Content Examples That Prove the Little Guys Can Compete appeared first on Sujan Patel.